Business History and International Business are cognate subjects. There are few, if any, studies of international business that do not require a proper study of context. International business decision making must be made relevant by a considered evaluation of the circumstances surrounding that decision. This often means putting it into its historical context. The contributions that the study of international business can make to business history are the input of appropriate theory and appropriate research methods. 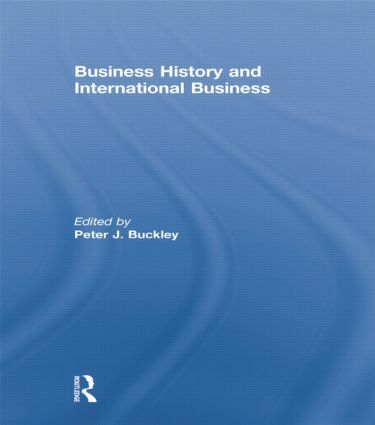 The best international business theory can illuminate the seemingly disparate strategies of firms in given historical circumstances and can provide an integrated, overarching conceptual structure of the study of business history. The research methods used in international business are also worthy of scrutiny by business historians. The proposition of this book is that international business theory and method can complement business history. This cross-fertilization has been occurring with increasing regularity over the past few decades and this book brings together some of the fruits of this conjunction of two important intellectual domains. This book was published as a special issue of Business History. Peter J. Buckley, Professor of International Business and Director of the Centre for International Business, University of Leeds was President of the Academy of International Business 2002-04. He is currently Chair of the European International Business Academy. He holds a Changjiang Scholarship at the University of International Business and Economics, Beijing.